Today, my favorite author, Terry Pratchett passed away. He was 66. I am very sad, but not entirely sad. Pratchett had been suffering from a rare form of early-onset Alzheimer’s Disease since 2007, or even before that. He died of natural causes. Pratchett has written or co-written over 70 books, and has sold over 85 million copies worldwide. Pratchett, an Englishman (who had been knighted some years back), is the 7th most read non-US author in America, where I live. Pratchett has been best known for his Discworld fantasy novels. The Discworld is called that because it is a flat planet, spinning like a record album. These books are in many ways unlike any other fantasy stories out there. They are not only stories set in a fantasy world, they are commentaries on the human condition. The books all contain deep wisdom and insight into what makes us.. us. Many of the books are also quite funny. Pratchett had a classic style of British humour. Think Douglas Adams, only a lot better, in my opinion. Pratchett often took on heavy topics like religious intolerance, bigotry, and social injustice. He did this while crafting very original stories and making people laugh. Sometimes he would take on Shakespeare. Sometimes his books would incorporate elements of more recent stories, like “Lawrence of Arabia.” In fact, in one book, he not only had part of the story be a parody of that film, but he also put in a whole plot line based around the Kennedy assassination, and tapped into the conflict between Western and Middle Eastern cultures.. all in one novel. He’d even include pop culture references, for example, certain lines from “Pulp fiction,” or a critique on the modern New Age movement. Even if fantasy is not your favorite genre, you might still quite enjoy Pratchett’s books. He is the only fantasy author whose novels I read regularly. Some of them are so wonderful I re-read them 2 to 4 times a year. There are something like 40 Discworld novels. I’ve read less than half of them, but plan on reading them all. There are four main Discworld series. Each one involves a central cast of characters. 1. Rincewind the Wizard. These books are about a hapless wizard who cannot work any magic, and keeps getting drafted into all sorts of adventures. His home base is a school of wizardry. Lest you think the whole wizard school thing is a Harry Potter knock-off, I’d like to point out that the first Rincewind novel, “The Colour of Magic” (also the first Discworld novel), was published in 1983, several decades before the Harry Potter stories were published. 2. The witches. Three witches, all humorous and very smart in their own way. They have all sorts of diverse adventures.. some in faraway lands, and some in their own isolated part of the Discworld. In the second Witches book, “Wyrd Sisters,” Pratchett presents a re-telling of Shakespeare’s “Macbeth,” and also brings in a few elements from “Hamlet” and “King Lear.” Although “Wyrd Sisters” was one of the most grim of the Discworld novels I’ve read thus far, and one of the longest, it was also one of the best. 3. Death. The main character in this series of novels is the Grim Reaper. I’ve only read one Death novel so far, so I can’t comment on this much, except to say that Death tries to be kind, and shows up in all the novels I’ve read thus far. The first Death novel, “Mort,” was pretty good. I’ll read it again later this year. 4. The NIght Watch. This series is about the police force of Ankh-Morpork, the largest city on Discworld. The force is made up of humans, dwarves, trolls, a female werewolf, and eventually other species such as gnomes, several golems (creatures from Jewish mythology), a vampire and a zombie (zombies of Discworld aren’t dumb flesh-eating monsters. They retain their intelligence and personality, but just happen to be dead). The Watch books are the most original police procedural/mystery books I have ever read. My two favorite series are The Watch and the Witches. If you’d like to get started with a Discworld novel, I’d suggest either the first Watch book, “Guards! Guards!” or the first Witches book, entitled “Equal Rites.” (Yes, “rites” is spelled that way on purpose). Besides the books that are a part of the four main series, Pratchett also wrote other Discworld novels. I just finished an excellent story called “Moving Pictures.” It is parody of the Golden Age of Hollywood movie making, set within a fantasy context, and blending in quite a bit of the Cthullu mythos of author H.P. Lovecraft. Here is a reading guide for the Discworld novels. It isn’t entirely up to date, but lists almost all the novels, and in what order they should be read. 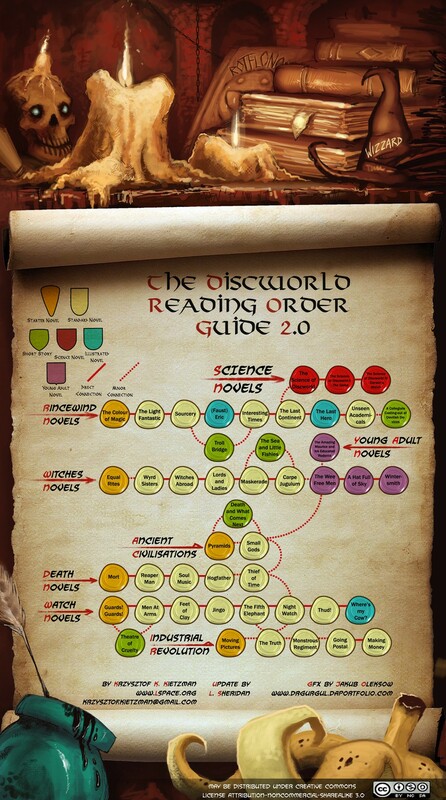 http://www.lspace.org/…/the-discworld-reading-order-guide-2…. This is a PDF with small print, so you’ll want to use the zoom-in feature. Many of the Discworld novels, in my opinion, are some of the best books ever written, and have brought joy to millions of people across the world. Rest in peace, Terry Pratchett. ← a harmonica buyer’s guide for beginners. Would it be okay if I reproduce this post on this blog I’m building in memory of Terry Pratchett? I will, of course give full attribution and link back to your original article here! Certainly! Thanks for asking. I’ll check out your site. Have posted it. Let me know if there is anything you want changing, extra links, etc. Looks good. Thanks for including my post!